As absurd as it may sound, your pee can provide useful insights to your health. The color of your urine can change depending on what you’re eating or the medications your taking. In some cases, it may also indicate a disease or a certain health condition. This is why it’s important to know which colors are considered normal and which colors are giving you a heads up in terms of your health. Here’s a quick guide to help you understand more about your pee, based on a list by LiveScience. Pale Straw Color - Your pee is completely normal indicating that you’re healthy and well-hydrated if your urine is pale straw in color. Transparent or No Color - If your pee is colorless and resembles water, it means you’re probably drinking more than what is needed. 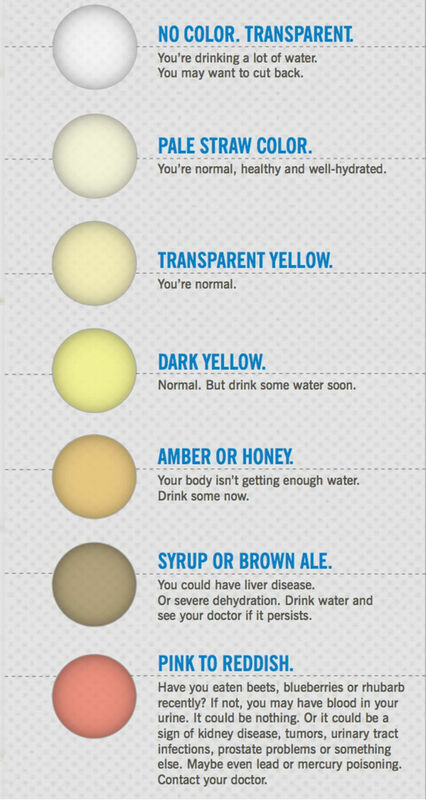 Dark Yellow/Honey - You need to drink up and rehydrate yourself if your urine is dark yellow in color. Bright Orange or Yellow- This color is especially common for individuals taking vitamin B and beta carotene supplements. Brown - A brown pee can either be a sign of dehydration or liver disease. If this persists, consult a doctor immediately. Blue or Green - Blue or green urine can be a result of a variety of medications such as nausea drugs, antidepressants, anti-inflammatories, antibacterials and antihistamines. It is also possible that you are suffering from rare genetic conditions like Hartnup disease and Blue diaper syndrome. Consult a doctor if this persists or if it occurs in an infant. Pink to Reddish - This color is bothersome except if you have recently eaten blueberries, beets or rhubarb. If you haven’t consumed any of these recently, it is possible that you have blood in your urine. It could be an indication of a kidney disease, urinary tract infections, prostate problems, tumors or even mercury poisoning. See a physician immediately once you see this color.